It never fails, we budget for our groceries, but the bill always ends up being more. We underestimate, run out of things faster than expected and overall, everything is becoming just too darned expensive! To make things a little bit easier, here are 9 simple ways you can start saving money on your groceries. 1. Go with a List: Yes, I know…it’s a pretty obvious suggestion, but it’s amazing how effective it can be. You can purchase only what you need and avoid all the other yummy distractions of the grocery store. 2. Meal Planning: Planning your meals in advance makes it easier to get your list together and ensure you buy only exactly what you need. You can get help with your meal planning at Dine Without Whine AND they actually put your grocery list together for you too. 5. Cook from Scratch More Often: Yeah, yeah…it sounds easier said than done, but it doesn’t have to be too complicated. It’s no secret that pre-packaged items and convenience foods come at a premium price. They save you time in preparation, but they eat up your budget and let’s face it, time IS money. Plus, if you’re using Tip #2 and planning your meals, cooking from scratch more often is a whole lot easier. 6. Comparison Shop Before You Leave Home: No, I’m definitely not suggesting you go from store-to-store looking for the best deal. That takes too much time. Check the flyers that come to your door and see who is offering the best deals on what you actually need. If you don’t have any flyers at your door, visit the store website as they generally post flyers online. 7. Use Coupons Sparingly: Sure, coupons offer a great deal, but most coupons you’ll find are for items you don’t really need or use. Resist the urge to think, “Wow, that’s a good deal” and search for coupons based on items you need to purchase instead. 8. Keep the Little Ones At Home: If you have young children that want everything that they see, it’s easy to get into the trap of buying items you don’t need, treats that aren’t healthy and become victim to other grocery store distractions. Keep the kids at home with Daddy (it’s a good bonding opportunity) or a relative. You can even swap grocery store shopping times with your neighbor. Not only is this one of the 9 ways to save money, but you’ll save your sanity too! 9. Make Quick Stops for Fresh Ingredients: This may not be easy if you’re on a tight schedule, but if you can work it in, it can save you a bundle. One of the biggest culprits in grocery budgets gone bad is spoiled food. If your fruits, veggies and other perishable items are always going bad, consider shopping for them more frequently, but in smaller quantities and restrain yourself from buying items you don’t need. If you have any teen-aged kids, this would be a great chore for them too. 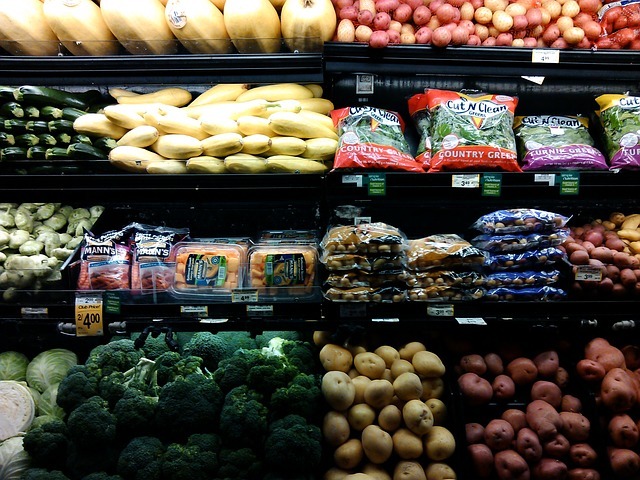 There you go – 9 ways to save money on groceries. But in order to make these tips work, you really need to have a plan in place. You need to know what your family needs and what you’ll be eating. To make your meal planning a whole lot easier, sign up below to learn how to plan your meals. Not only do you have 9 ways to save money but you and your grocery budget will be glad you did.